When? 1992 | Where? DVD | Rated? R.
Sappy melodrama has fallen out of favor, but come on, be honest, when you’re at home snuggled up on the couch and maybe feeling a little bit down in the dumps, there’s nothing better than a sweeping love story set against an epic backdrop. 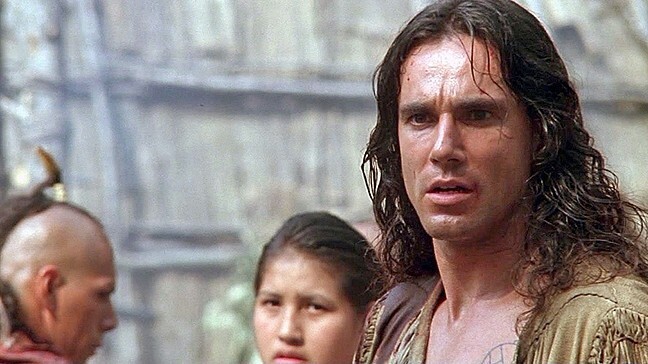 Go head, grab a box of tissues, some bonbons, and have yourself a good cry with The Last of the Mohicans. Directed by Michael Mann (Manhunter, Heat, Collateral, Public Enemies) and featuring the great Daniel Day Lewis as Nathaniel Poe, aka Hawkeye, the film was beautifully shot by cinematographer Danta Spinotti in North Carolina’s wilderness. Several of the battle scenes, especially the hand-to-hand combat, are particularly well executed, which helps the film’s appeal with the guys. It’s the love story, however, that creates the film’s emotional core. Well, that and the idea that a noble people—the Mohicans—are on the brink of extinction. OUR HERO! : Daniel Day Lewis stars as Nathaniel Poe, aka Hawkeye, the adopted son of a dying Indian tribe. The film opens with a terrific hunting scene as Hawkeye, his adoptive father Chingachgook (Russell Means) and brother Uncas (Eric Scweig) race through an emerald green forest as they track an elk. Hawkeye takes aim, striking the running elk and felling it with a single shot; the point being, Hawkeye is a total badass. Later they see signs of a Huron war party and follow, showing up just as the Hurons attacked a British column escorting two sisters—Cora (Madeleine Stowe) and Alice Munro (Jodhi May)—to their father Col. Edmund Munro’s (Maurice Roëves) outpost. The three are able to defeat the Hurons and save the women, agreeing to accompany them to the fort. Once there, however, Hawkeye is arrested for sedition since he warns the colonial militia that their homesteads are being attacked and helps them escape the fort to go care for their families. There’s also a side plot about Magua (Wes Studi), a traitorous Indian who pretends to be a Mohawk on the British side but is really a Huron aligned with the French. The acting is uniformly excellent, and there’s a terrific chase scene down a river and through the forest as the Hurons come after Hawkeye and company after they escape British custody. The whole thing is about honor, nobility, courage, love, and early America—a country on the brink of becoming a democracy.